Fake banknotes, most of all the Malaysian ringgit, are being increasingly used in Thailand’s south, the Thai Association of Foreign Exchange warned on September 6. “Very realistic” counterfeit ringgit notes are being used by Malaysian visitors to Southern Thailand, and many shops owners, restaurant staff and even money exchanges are unable to examine the foreign banknotes for authenticity because they are not equipped with money detectors. Even banks have lodged reports to police after they received fake notes from locals and tourists. The most common fakes are the 50 and 100 ringgit banknote. They are also circulating inland in Malaysia in areas with high visitor traffic such as Malacca. Police said that the notes are “easily” produced with a personal computer, scanner and printer and come close to the original in look and feel, but lose some details of lines and patterns, microprints and the small strip embedded in the genuine notes. Thus, the fake notes are mixed into real ones to deceive staff at several outlets and to cover the fact that they have the same serial numbers. 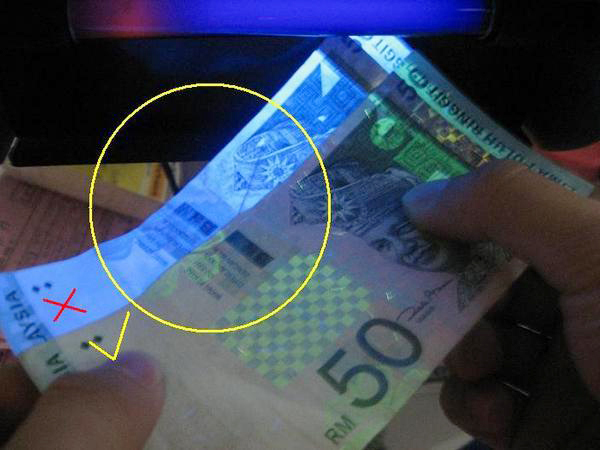 To detect a fake ringgit, notes need to be checked with an UV money detector and also be checked for the watermark and the holographic texture. Other fake currencies found in Thailand include Indian rupee and United Arab Emirates’ dirham. As per Thai law, those who knowingly pass off counterfeit currency can be imprisoned for up to 20 years.